ADVENTURE FEST CHATTANOOGA IS CANCELLED DUE TO BUDGET CUTS. thank you for your interest and we hope to see you out there. JOIN US FOR THE MOST IMMERSIVE OUTDOOR FESTIVAL OF THE YEAR! We've launched our Pre-Sale tickets! Use code: memberbrew17 and get a tasty craft brew included in your ticket! Also, a portion of tickets sales will benefit our friends at First Descents. Order here before they are gone. 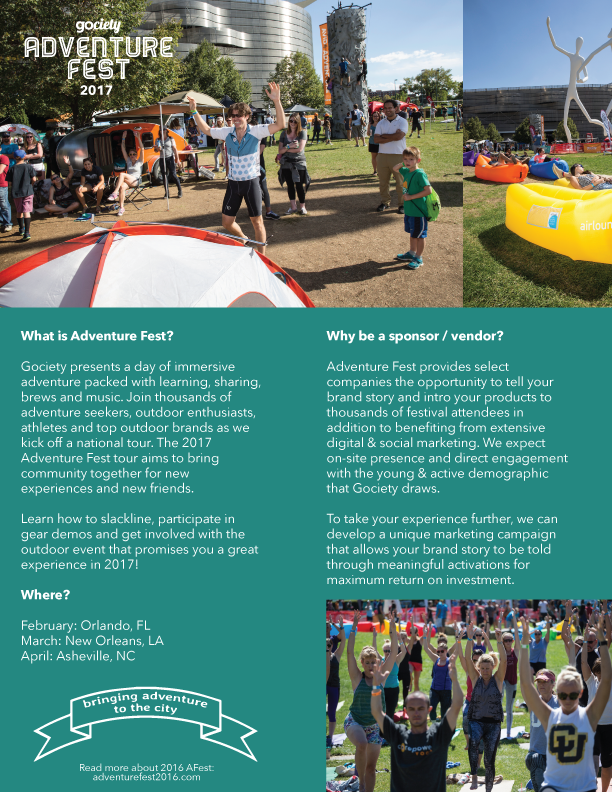 Gociety presents Adventure Fest Chattanooga 2017, a day packed with learning, demos, sharing, brews and grooves. Join thousands of adventure seekers, outdoor enthusiasts, athletes and like-minded individuals as we bring the adventure to the city on May 27th. Find new experiences and new friends. We're excited for Chattanooga's Appalachian views and riverside activity so come out to connect with nature, dance to music and enjoy a craft brew! Get Social: Stay in the know and see who's going by getting on our Facebook list here. Tour tiny homes, take a SUP demo, join us for yoga on the lawn, take a lap on the climbing wall, jump into a gourmet outdoor cooking demo, learn to juggle, try new gear or just kick back in the hammock with a craft brew. This event is very family friendly and youth participation is highly encouraged! Children 12 and under are FREE! Here's Our Adventure Schedule For The Day. More To Come! Gociety is proud to partner with First Descents to extend the healing power of adventure to young adults impacted by cancer. We are donating $1 from every Adventure Fest ticket purchased to support First Descents’ free adventure programs nationwide. Be sure to visit the First Descents tent at our five exciting Adventure Fest locations this year!